There are a lot of R2 units across the galaxy, but there is only one R2-D2. 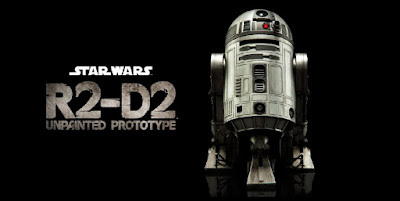 Fresh off the factory line and available only as a special convention exclusive, the R2-D2 "Unpainted Prototype" Sixth Scale Figure is Sideshow's favorite plucky little droid ready for a new round of adventures. Based on the R2-D2 Deluxe Sixth Scale Figure, everyone's favorite astromech has been re-imagined as an unpainted prototype droid with a distinctive monochromatic silver finish. Equipped with hinged panels and articulated light-up dome, this unique limited edition exclusive will be an excellent addition to any Star Wars collection! Pre-order the R2-D2 Prototype for SDCC 2016 at Sideshow Collectibles now.